after lunch into a school backpack or after an outdoor event all the while still displaying your logo. Applications include elementary schools, daycare facilities, outdoors related, promotional items. backside clear window identification card pocket, Velcro closure, padded top carry strap. 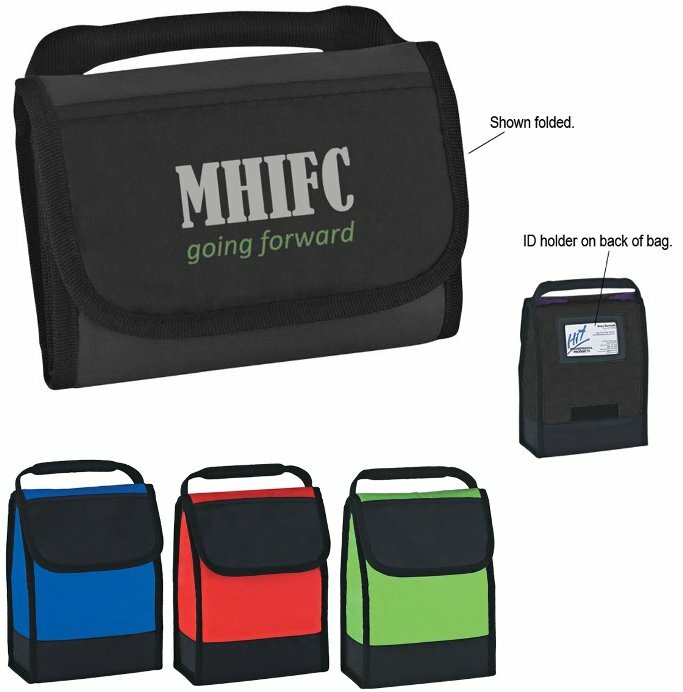 Size of the lunch cooler open is 7 1/2" w x 10" h x 4" d. Folded 7 1/2" w x 5" h.
Colors are Forest Green, Royal Blue, Red and Lime Green all with Black Trim. Delivery from date or an order is 3 weeks. Price includes a one color print on the flap in an area 4" w x 2" h.
This lunch cooler has a maximum of a three color print.